← What Would Bill W. Do? 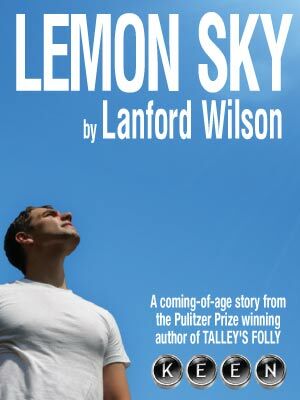 Lanford Wilson’s Lemon Sky has been revived by the Keen Company and is playing at Theatre Row. This play is considered the most autobiographical of Mr. Wilson and was last revived in 1985. The play, told in flashback and predominantly set in the late 1950s, is the story of a brief reunion between a father and son. Directed by Jonathan Silverstein, this very lovely play falls a bit short of brilliant. There are some beautifully directed and acted moments, but there is also a small collection of distractions. The characters, their interactions and dialogue are drawn so realistically. While we suspect what’s coming at every turn, the discovery is not really the point. The point is how people connect, or disconnect, and what stories they tell themselves along the way. This production has enormous potential, but falls just a bit short. When mounting a small ensemble production, it is imperative that the onstage talent is in balance. This is simply not the case with this production. Eldest child Mr. Bruner is a very self conscious child actor. Had he been the only child, one would chalk it up to child blindness (for some reason, casting directors often can not discern talent in children, going for appearance only) but Mr. Bruner is paired with the excellent Zachary Mackiewicz. Ms. Gold is awkward and ill at ease, playing the fragile, potentially fascinating Carol with an extreme heavy hand. Adding to this distraction is the fact that Ms. Gold is simply not the right physical type for this role. She is not done any favors with the costume padding and “bump-it” hairstyling device. Carol’s costuming doesn’t hit the right note any more than the set does. Doug works third shift in a factory, the mortgage is paid with the foster child allotment. There is no way that their home would be furnished with such obvious 1950s items. Furniture was expensive back then, and new furniture would not have been within reach for a working class family. Distractions aside, this is a very good play and a fine production. If the past is any indication of the future, it does not get produced often. For this reason, I encourage you to see it.